When the roads of Marlton, Mt Laurel, and Cherry Hill call your name, make sure that you’re hopping into the throne of a legendary vehicle that aims to deliver on all your performance cravings. So if you want to dominate your route like never before, up the ante on your next adventure by choosing the 2018 Honda Civic. Let’s learn more about the thrilling details of this compact road cruiser by diving into this 2018 Honda Civic review created by Burns Honda. By opting for the agile performance, upscale technology, and convenient safety of this sedan, you’ll drive confidently during every spontaneous getaway or daily commute. With this intuitive system, your vehicle will automatically monitor your surroundings and warn you when a dangerous situation is detected by deploying visual or audible alerts. That way, you can make the necessary corrective actions to avoid a collision and keep yourself out of harm’s way. Any frequent driver understands the importance of fuel efficiency. While you’re racking up miles on your odometer, you want to be sure that your car will help you avoid filling up on gas too often. To keep you supplied with a boost of forceful strength, the Honda Civic serves up a standard 2.0-liter i-VTEC® engine that churns out 158 horsepower and 138 lb-ft of torque. Taking a step up, the available 1.5-liter turbo motor hustles along the road with the energy of 174 horses and 162 lb-ft of torque. With those numbers, a slight press of the accelerator will have you leading the pack down your route. And by pairing all that power with the optional 6-speed automatic transmission, your sedan will seamlessly switch gears and send you surging down the highway. If you’re looking for guidance along the road, this intelligent sedan features an optional navigation system so you’ll make it to your destination without a hitch. On top of that, this device comes with 3D graphics for enhanced visibility and HD Digital Traffic™ that actively updates your route based on real-time traffic conditions. That way, you’ll never risk arriving late to an important event. 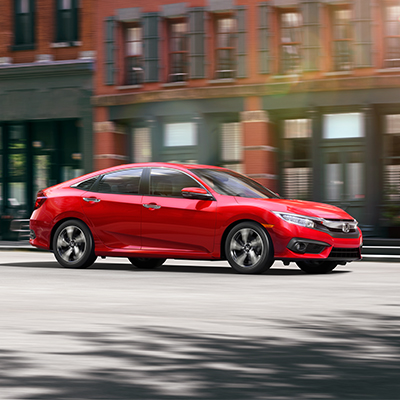 Test Drive Your 2018 Honda Civic Today! You deserve to course along the streets of Marlton, Mt Laurel, and Cherry Hill with the performance, technology, and safety amenities of your dreams. And for a drive unlike any other, choose the 2018 Honda Civic as your next vehicle. Don’t wait around to discover more of the exciting tools contained in this sporty sedan. Stop by the showroom at Burns Honda or schedule your test drive today!